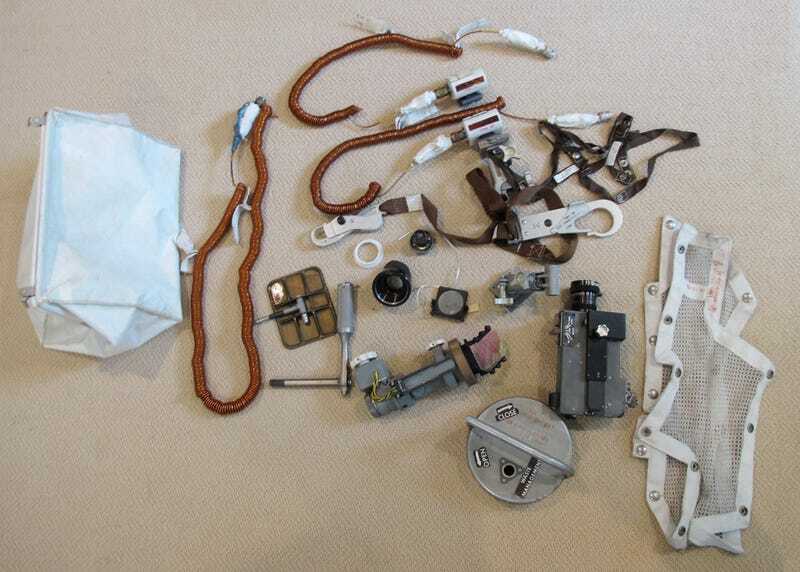 These are the contents of a mysterious white bag found hidden in Neil Armstrong's closet: Weird looking lamps, wrenches, utility brackets, sights, and a film camera that later was identified as the one that captured the famous Apollo 11's descent on the Moon's surface. Nobody knew about it, including his widow. After Neil Armstrong's death, his widow, Carol, discovered a white cloth bag in a closet, containing what were obviously either flight or space related artifacts. She contacted Allan Needell, curator of the Apollo collection at the Smithsonian's National Air and Space Museum, and provided photographs of the items. Needell, who immediately realized that the bag—known to the astronauts as the Purse - and its contents could be hardware from the Apollo 11 mission, asked the authors for support in identifying and documenting the flight history and purpose of these artifacts. After some research it became apparent that the purse and its contents were lunar surface equipment carried in the Lunar Module Eagle during the epic journey of Apollo 11. These artifacts are among the very few Apollo 11 flown items brought back from Tranquility Base and, thus, are of priceless historical value. Of utmost importance is the 16mm movie camera with its 10mm lens. The camera was mounted behind the right forward window of the lunar module and was used to film the final phase of the descent to the lunar surface, the landing, as well as Neil Armstrong's and Buzz Aldrin's activities on the lunar surface including taking the first samples of lunar soil and planting the US flag. Thanks to the Neil Armstrong family, the Apollo 11 purse and its contents are now on loan at the National Air and Space Museum for preservation, research and eventual public display. The McDivitt Purse, named that way in honor of Apollo 9 Commander Jim McDivitt, who wanted a stowage bag that could be positioned at the front of the spacecraft to hold items, such as the purge valves, which might otherwise fall to the cabin floor while they were preparing for EVAs. The Alignment Optical Telescope was used for navigation while flying the Lunar Module, "a periscope-type device that protruded through the top of the LM. The astronauts used AOT to make direct visual sightings and record precise angular measurements of pairs of celestial objects."